At the end of September 2015, in the fifth year of the relentlessly ruinous Syrian civil war, all the world has been forced to take account of some two million refugees from that conflict, along with those from other ruined countries, seeking asylum in Western Europe–or as close to the West as they can manage. What did we expect? 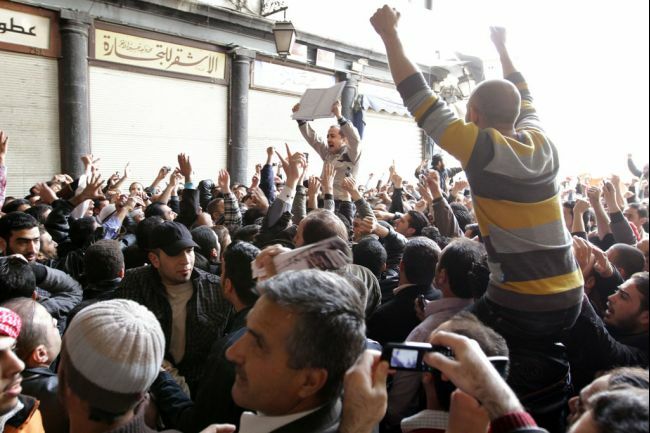 In the spring of 2011, at the tail end of the Arab Uprisings, Syria suddenly began to implode. Bashar al-Assad’s regime reacted brutally, heavily documented by viral cellphone videos, against the localized rebellions. Very soon there were more rebel groups than could be sorted out. Later, amid the widening conflict, Barack Obama threatened retaliation for the Assad regime’s alleged use of chemical weapons. It was a nasty confrontation, since the Syrian regime was backed by Iran and by Russia. When the chaos began, the regime of Bashar, an English-educated opthalmologist and his pretty banker wife, with their ideas of social reform and their inherited autocracy, had been holding the fragmented country together– Sunni, Alawite, Shia, Kurdish, Christian–for more than ten years, in conditions of severe drought with ongoing factional disputes. Naturally this neo-colonial construct fell apart in an instant, the cities and archaeological sites collapsing in slow motion over the next four years. Various Sunni-majority states, such as Turkey, Qatar, and Saudi Arabia, along with the U.S., Britain and France, continued to support, sporadically and covertly, the discordant rebel factions. Now we’re waiting hopefully for the U.S. to acknowledge that peace in Syria can only be achieved by including the country’s only legitimate government, which is still Assad’s. It may not have been a perfectly democratic election, but whose is? 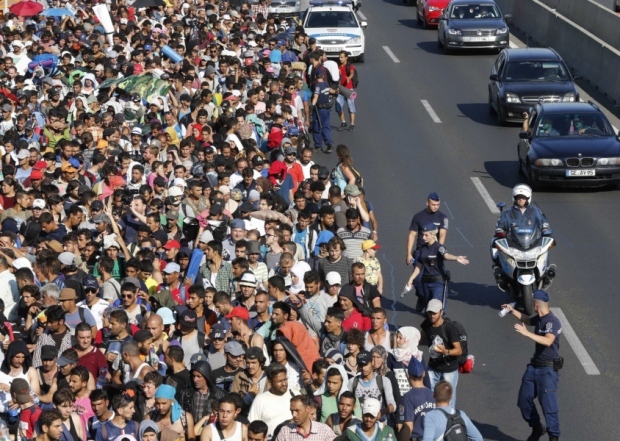 At this point, there should be meaningful negotiation with all parties agreeing to fight the common enemy, ISIS–and to stem the flow of refugees with massive foreign aid. How long will it take? Rebuilding Syria’s economy, heavily dependent on tourism, will no doubt include reconstruction of Syria’s six UNESCO World Heritage sites dating back six thousand years. 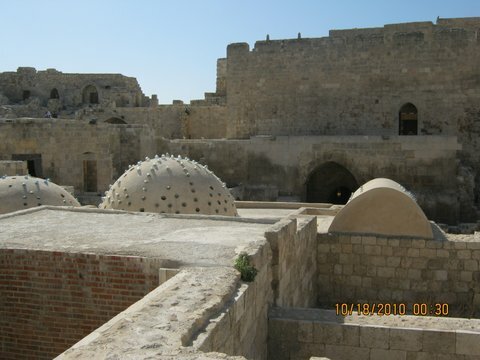 Aleppo is one of the oldest inhabited cities in the world, a prize among imperial conquests long before Alexander the Great. Much still remains of massive crusader castles and even of Roman Palmyra. Mosques, markets, madrasas, and oil fields have all been damaged in the crossfire between the Syrian army and rebel militias. In October 2010 We were staying in Damascus in a quiet guesthouse near Bab Sharqi, when the poor Tunisian fruit seller sparked the series of uprisings first known as the Arab Spring. Syria took longest to ignite, but every place where we stopped then would soon be ravaged by the rising fury of young men without work, of impending famine after a four-year drought, of Shia, Sunni, Alawites turned against the regime and each other. That October, a Palestinian exile, our driver, and the Iraqi Christian who gave us breakfast, were still safe under a firmly non-sectarian regime. On a day trip from Damascus to the Roman ruins at Bosra, we stopped for water in the dusty little city of Deraa. Deraa, the southernmost settlement in Syria, had always been the main stopover between Baghdad and Damascus. That October it was crowded with refugees from the drought in the northeastern desert, and with others from across its porous borders with Lebanon, Israel, and Jordan. Not surprising that it would be the Syrian flashpoint of the Arab uprisings. A few weeks after we passed through, some bored Deraa youngsters posted anti-government graffiti and were arrested. The locals massed to demand their release, and government security forces firing on the crowd were filmed on cell phones. When one of the protesters died, sympathetic rebellions broke out in other settlements to the north and east, and were brutally repressed. Protests erupted next in Deir ez Zor, a town on the Euphrates which had once been an important trading post between the Roman Empire and India. Near Deir, in 2006, the Israelis had bombed a nascent nuclear development plant, acting on intelligence from both the C.I.A. and an Iranian general. But only four years later, we Americans seemed to be welcomed as the harbingers of coming tourist masses. The owner of our hotel gave us a preview of his new restaurant, which had a southwest American motif and dance-hall chandeliers. Tourism had increased fourfold in the past year, he said. In a 2012 news photo of the main street of Deir, every facade has been shattered, leaving cross-cut views of the crumbled interiors. Further south, we explored the ruins of Sumerian Mari and Roman Dura-Europus, where the ancient east-west trade routes intersected with the Euphrates. Returning to Deir, we crossed the old suspension bridge over the Euphrates; its eastern end was at the Iraqi border, then quiet. Note: Marking the long tradition of conquest in Syria: Deraa, Deir, and Dura all mean “fort” in different ancient languages. Syria’s northeast regions, including Deir ez Zor and Rakka, hold most of the Syrian oil reserves. There the land and the oil have been controlled by tribal warlords, with the regime looking the other way as long as they received a share. Now the new Islamic State is taking over, with an effective combination of intimidation and nutrition. They have established an effective network to produce and distribute bread at a low cost, and free to the poor. In the far north, Aleppo, the largest and most historically important Syrian city, was bombarded by both the government and successive rebel factions. When the seventeenth-century Souk Madina went up in flames, we tried to make out, on some video footage, the smoky corridor that led through the market to the old house hotel where we had stayed. We did remember lovers trysting in the shadows of the citadel. 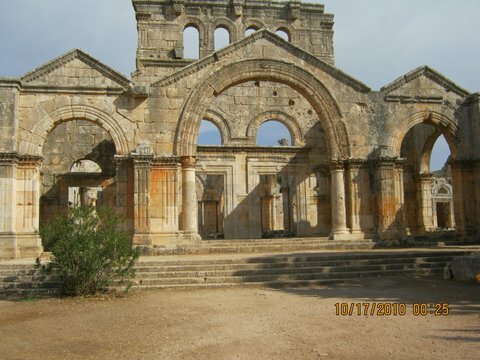 North of Aleppo are the ruins of the monastery church of St. Simeon Stylites, where the saint was alleged to have lived atop a pillar for thirty years, its height increasing with his growing distaste for the mob below. A stub of the pillar where he preached his angry fundamentalist sermons sits there in the middle of the Byzantine ruins, but we were more interested in the activity on the slope below. 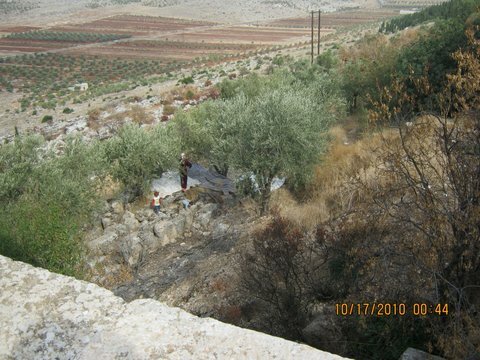 Two women in headscarves were laying cloths on the ground while small children scampered among the olive trees. Not a picnic, said our driver–an olive harvest. Olive oil is Syria’s number one export, he said, adding that the women were Kurds, and shrugging when we asked him how he knew. Kurdistan was part of the area sometimes called the Levant, which also included the coastal Palestinian territories, Lebanon, and part of Jordan. After the First World War, the victorious Allies–in a series of agreements, some public and some secret, all self-serving and conflicting–carved the lands of the former Ottoman Empire into spheres of influence. With desultory attention to tribal religious and linguistic questions, the new borders were in complete accord with colonial interests. Russia’s share included most of the former Ottoman Empire, Britain held the Palestinian mandate, and the remainder of Syria, much diminished, became a French protectorate. 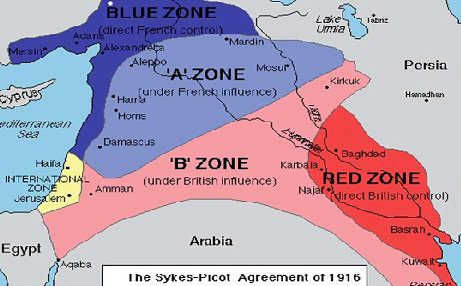 The boundaries set by the Sykes-Picot Agreement of 1916 form the main western carapace now targeted by the newly-formed Islamic State. Southwest of Aleppo is the desert town of Ma’aret al Nouman. On a hot, dusty morning, we parked in the crowded market square by the old mosque. In the courtyard, two teachers came out to meet us, and we glimpsed a few boys’ faces pressed curiously against the schoolroom windows. The girls, of course, were in another school. Ma’aret’s museum was a former caravansary carpeted with late Roman mosaics, mainly lively animal and vegetal fantasies, improbably well-preserved. Following us through the rooms ringing the central courtyard, an emaciated guard with kohl-ringed eyes turned on lights and offered cups of tea. In Ma’aret in 1098, when the bloodiest of the Crusaders’ battles were raging, a pack of famished Franks fell upon a heap of recently slain townspeople, cooked and devoured them. The babies, it was said, were spit-roasted. More than one contemporary chronicler recorded this tale of Western brutality, which of course survives in the Arab world even after a millennium. Crusaders slaughtered hundreds of thousands of Muslims, but during the colonial decades, western schoolchildren were taught mainly about the barbarism of the infidels occupying the Holy Land. 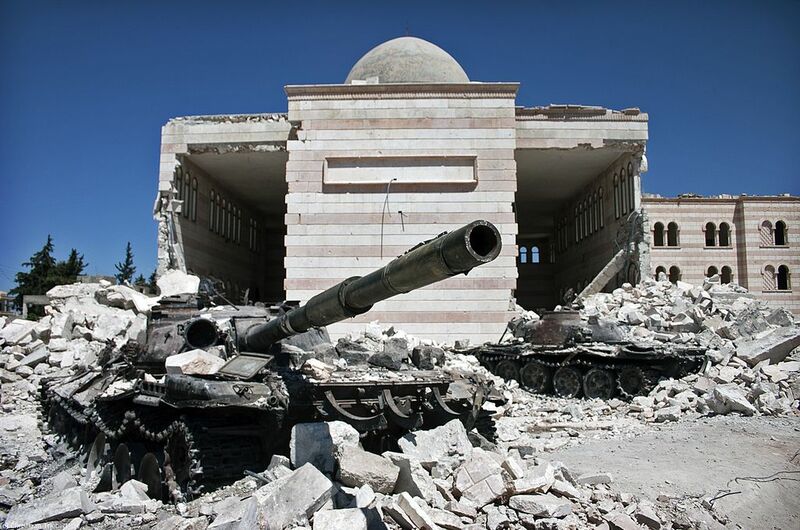 The Ma’aret museum was shelled in October 2012 and at last report was serving as a rebel stronghold. A video from an archaeology site showed a young soldier in the courtyard, trying to fit a jagged mosaic fragment into a larger design. 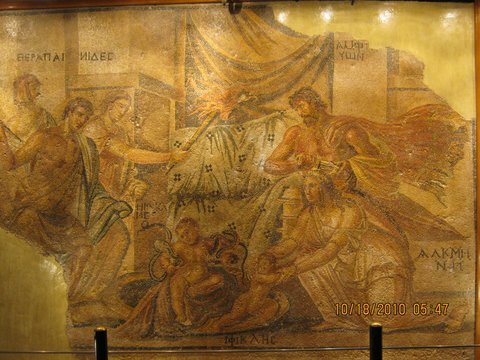 Months later came reports of a truckload of Roman carpet mosaics being stopped at the Lebanon border. 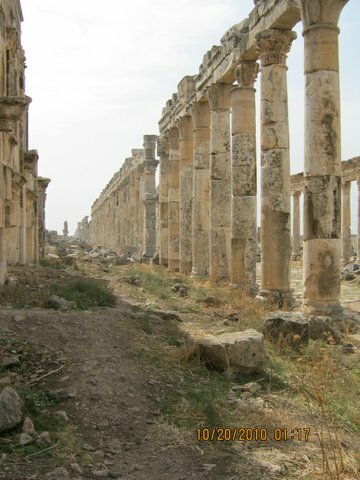 The soil of the Roman ruins at Apamea is now densely pocked with looters’ exploratory holes. There are those who hold that looting has at least the potential for saving precious artifacts from destruction. As we traveled west from Ma’aret and into the mountain passages that led to the eastern Mediterranean coast, our driver pointed out that most of the towns were mainly Christian; women were moving about freely with uncovered heads. However, our next stop was Ugarit, whose cuneiform alphabet made it the center of the literate world in 1300 B.C.E. At the excavation site we were served refreshments by two women who were the wives of the cafe’s owner. Especially in Alawite country, Bashar al-Assad’s mild, unprepossessing image was everywhere, on awnings and kiosks and windshields, fluttering on banners. Our well-connected driver said that Bashar and his wife often went out of an evening without guards. He had been introduced to them in a restaurant and confessed himself impressed that Assad stood up from the table to shake hands. A thousand years after the Franks had abandoned their last forts along the eastern Mediterranean coast and in the mountains, Christian settlements still endure where the Crusaders first invaded, constructed forts and castles—and deposited their genes and their religion. We stopped in the little port of Tartus. Ibrahim ibn Yakub at-Turtushi was a well-traveled Jewish trader whose tenth-century description of the city of Prague begins many Czech histories, including one I edited. 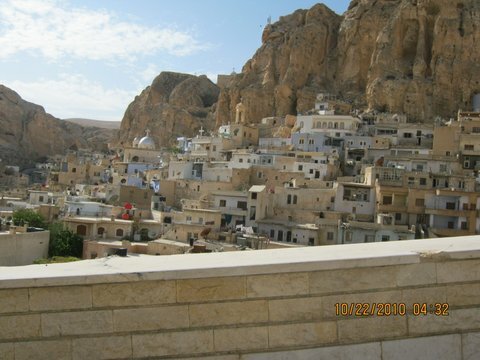 I had never expected to see Ibrahim’s hometown of Turtushi (Tartus). Originally a Phoenician colony, it became a marginally prosperous port, with an inhabited crusader fort on the embarcadero festooned with citizens’ laundry. Intermittent attempts have been made to depict Tartus as a powerful Russian naval base, supporting the flow of arms to the Assad regime. Yet reportedly only four men ran the Russian port facility and one of its two floating piers was inoperative because of storm damage. 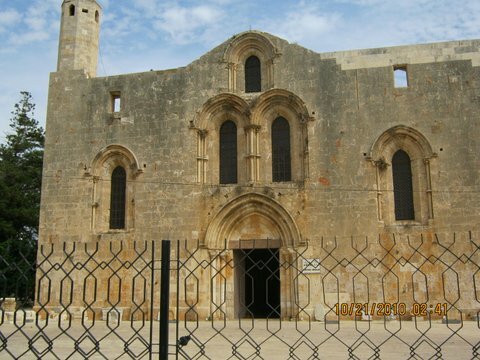 From the port we progressed to a very plain Gothic church, once an early Marian chapel, later a mosque, later still a billet for Ottoman soldiers, then restored by the French and eventually turned into a museum of musty Crusader tombs. 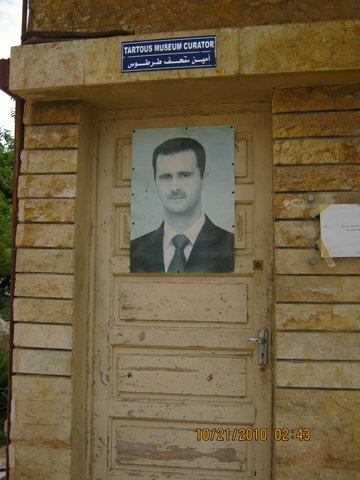 Outside, at the gate, a door labeled “Museum Director” sported a poster of Bashar al-Assad. Tartus, largely loyal to the regime, has remained relatively unscathed during the war, and a sizable number of its youth try to avoid serving in either the army or the rebel militias. Both Alawites and Christians live in increasing fear of the rising power of the new Islamic State. From the coast, we turned back east and drove out of the marine heat up into mountains, across pine-strewn ravines and around rocky hairpins, arriving finally at a hotel on a promontory just across a deep gorge from Qualat Salah es din, Saladin’s castle. Looking across the gorge in the gathering coolness, we decided to take the last hours of light to wend our way up its precarious access road. From the fortifications, the marauders’ sea was a distant blue through the pines. The site seemed impregnable, but Saladin and his forces drove out the Crusaders before the mortar was dry in the walls. On the way out of the castle, we stopped in the entry hall, where our driver was having tea with the guardian, an old friend who was keeping the site open late for us. But neither of them could explain to us how the immense stones of the wall had been dragged up the mountainside and fit into place a millennium ago. At our hotel across from the castle was a more modest construction site—adding a new floor for the anticipated tourist rush. The work stopped only after we returned from a nearby hostelry, where we we had enjoyed our grilled fish and near beer entire alone in the establishment. In the morning our driver handed us water bottles for our coming trek through the mountains and across the Al Ghab plain to Homs. Homs was Syria’s third-largest city, but its population as well as its buildings have been decimated by repeated shellings by the government and the insurgents. In 2011 it seemed a very prosperous place. We stayed for only a day in a large, comfortable hotel liberally lined with oriental rugs and potted palms. In the hotel restaurant we were approached by a voluble young woman with a French accent who declared herself delighted–in a curiously proprietary way–to find that Americans were visiting Syria. We stood on the edge of the Homs tell at sunset, listening to the calls of the muezzin across the city. A countertenor from a minaret on the left horizon rose above the others. One deep layer of the tell mound had been dated back to the biblical David and Solomon. Later, as we circled the darkening citadel playground, small sheep-eyed kids shouted “Hello, hello!” and a few were brave enough to answer when asked their names. We had taken a side trip that afternoon to Hama, half an hour away. The youths in the Hama souk had been far from friendly. In the markets and mosques of Damascus or Aleppo, in any public space, our driver, tall, dark, and broad-shouldered, usually marched slowly a few paces before us, looking directly ahead, running interference. In Hama’s souk, we strolled through a dark gallery during the slow period of the afternoon when markets were often closed. Dour young men in kaftans lined up to watch us pass. Nobody tried to sell us anything. 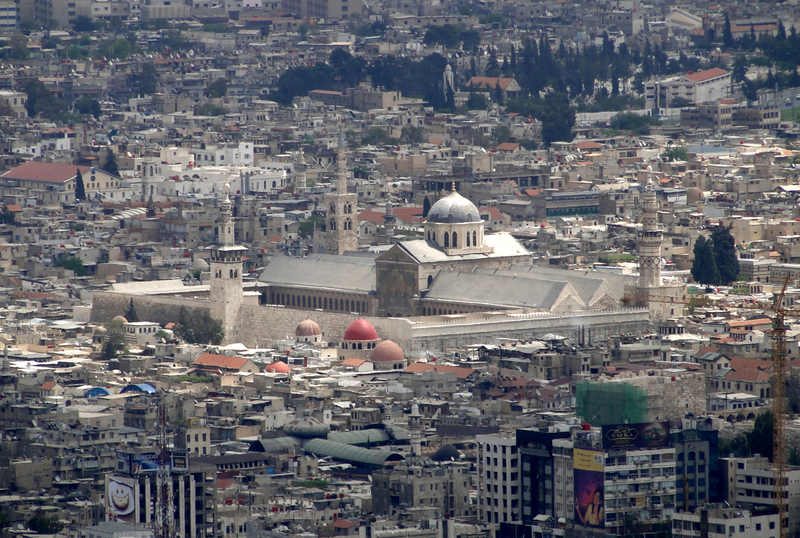 Hama was the home of the fundamentalist Muslim Brotherhood, where in 1982 Bashar’s father, the Lion of Damascus, brutally quashed a rebellion by leveling the old town and killing tens of thousands of citizens. The silent hostility in the tunnel of the Hama souk was just a shadow of that catastrophe. To some extent, Bashar al-Assad’s hope of saving Syria from chaos may rest, for better and for worse, on his people’s memories of the sectarian violence leading to the terrible Hama massacre, as well as the regime’s violence in crushing it. To the east of Homs was the Krac des Chevaliers (Qal’at Hosn), said by some to be the most perfect crusader castle in the world. Our hotel that night was another one under construction, in a big way. The manager had been to hotel school in Damascus and had learned to tell customers what they want to hear…in our case that the hammering would end in half an hour. After we went to our rooms, our guide and the manager began a long-running backgammon match on the terrace. Meanwhile the racket continued. During the backgammon match, we went for a walk around the road to the hotel, past a scatter of ugly new buildings, followed by a very orderly Bedouin camp oddly close to the roadbed. Farther on, scorched olive trees spilled down a burnt slope in an old quarry. In the valley, plumes of smoke rose from the fires of stubble preceding winter planting, and a few lights glimmered on the slopes across from the castle. The landscape reminded us of one on the other side of the Mediterranean, in postwar Italy. 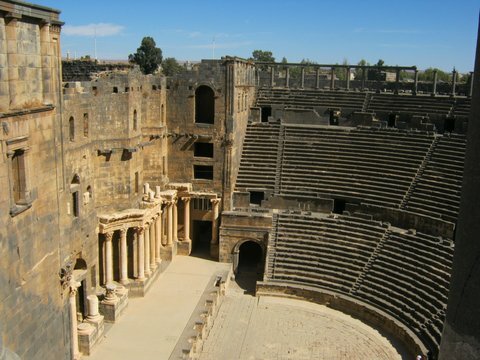 It seemed possible just then that Syria, with its ancient treasures, might indeed attract hordes of tourists. Meanwhile, it was a very long night, with acrid smoke from the day’s burning in the valley filling our room. On our trek back to Damascus from the coast, we detoured to visit Maloula, an old village of yellow and blue houses layered pueblo-style down a slope of the rugged Kalamun mountains. Biblical Aramaic, the language of Jesus, was still spoken there, and pilgrims visited its ancient monasteries—before the war of course. To enter a fifth-century chapel in the lower monastery, we had to pass through a police cordon, which seemed odd. Our guide pressed rapidly ahead into the small crowd, mostly in western dress, clustering around two smiling couples. The tall man in jeans and a blazer was Bashar al-Assad, with his wife Asma. With them were the late Hugo Chavez, president of Venezuela, and his young daughter, as well as another man in Arab dress, unknown to us. Assad and Chavez had just signed oil agreements in Damascus, probably with the Arab as well. Shortly before this meeting, Chavez, in a cheeky press blitz of countries not allied with the U.S. or Israel, had exchanged vows of loyalty and affection with the late Moammar Khaddafi of Libya. Assad, the mild-mannered opthalmologist, is the only survivor of this trio of strong men. 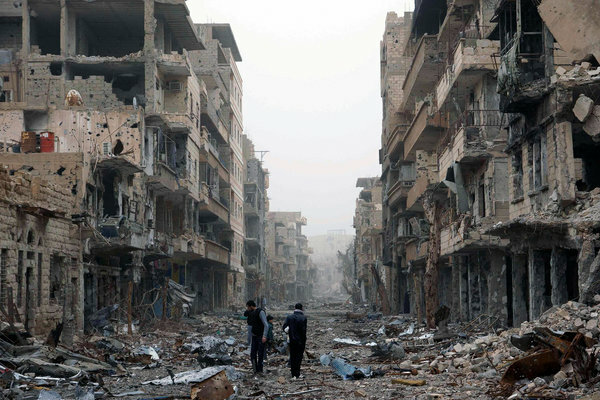 In November 2012, Maloula, still mainly loyal to the Assad regime, was struggling to stay out of the conflict, which one of its citizens said was the beginning of World War III. This was hardly an exaggeration, given the increasing part played by countries from Iran and Russia to the U.S. and Saudi Arabia. More and more this was becoming a proxy war. By 2014, loyalists in Maloula had fled to Damascus, where Bashar al-Assad planned to stay on as president of Syria, whatever is left of it. This is what remains of the small town of Azaz in northwestern Syria, near the Turkish border. In 1125 it was the scene of a famous victory of Crusaders against the Seljuk Turks. A thousand years later, during the Syrian civil war, it was captured by insurgents and then leveled by government forces. We didn’t see Azaz in 2010; this is a file photo. *Unless otherwise credited, all photos are by the author or taken from open sources.